Perhaps not everybody’s cup of herbal tea, the raw food movement is slowly taking over the world, or at least California. This is where the movement is at its most strong and some say it is where the movement started. It makes sense really; the raw food diet promises health, a sunny complexion, and that all elusive perfect body. In California, where the beaches are so often the center of life, and where Hollywood beauties roam, looking good is a very real life pursuit of many. Here we will give you a run down of some of the best places to try the raw food diet, at least for one meal, in California. A wonderful restaurant in Costa Mesa is ‘118 Degrees’, which is a humorous name referring to the temperature under which a food is considered raw. This restaurant offers a very trendy setting and an incredible menu to choose from. Some of the delicacies include sweet coconut wraps, apple cinnamon fig pecan cookies, sweet bread with almond butter, breakfast burrito, shitake sushi rolls, eggplant carpaccio, coconut ceviche, and pesto tortellini. CRU Organic Raw Food Restaurant in Los Angeles is located on Griffith Park Boulevard and was voted the Best Raw Food Restaurant in L.A. magazine’s 2007 review. The chef, Rachel Carr, creates dishes using influences from Italian, Japanese, Thai, Tunisian and Indian cuisine. The setting of the restaurant is comfortable, relaxing and atmospheric with a menu which includes spicy curried squash soup, vegan Caesar salad, herbed cashew cheese and fig pate, pesto ravioli, and chocolate fudge cake. CRU also offers a smaller menu of cooked vegan food, so everyone can have what they want. Another winning restaurant, ‘Alive!’, was granted the Best Raw Food Award in San Francisco. It’s found on Lombard Street and offers 100% organic food in a really comfortable ‘Zen’ setting. There is even a take-out service here, so you can call ahead, order and then drop by to pick up your delicious raw vegan dish. Examples of such delicious dishes include Asian noodles, pizzas and cheesecakes. 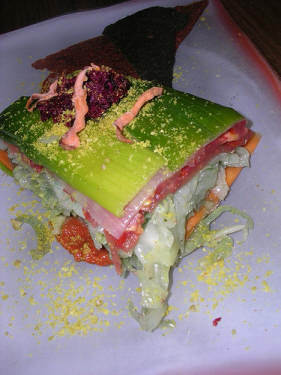 If you are a raw foodist, or have heard about the raw food movement, then you absolutely must try one of California’s amazing raw food restaurants. When in California, do as the Californians do and eat raw food! A great restaurant in santa cruz serving some raw entrees in Cafe La Vive on front street... very good..
please check out the Au Lac Vegan raw & Vegan fine humanese cuisine dishes here. Simpy GREAT Vegan raw cuisine. Probably the best yet!!!!!! Visit Euphoria on Main Street for AMAZING live food taste bud action and a good assortment of raw food lifestyle products. Sun Power Restaurant, my personal favorite, is located at 3311 Cahuenga Blvd in Studio City. Chef Rashid makes the best smoothies and raw pizzas in Los Angeles. The deserts are simply sublime.. There are a few cooked items on the menu. The staff is as great as the food and the place is extremely non pretentious. ISRAEL Is UNDER ATTACK!! INTIFADA!! ISRAEL NAVY STOPS FRENCH SHIP FROM GAZA!!! Bible Prophecy! MORE NUCLEAR PLANTS!VISION -ATTACK Of ISRAEL That Is Coming!Osama Bin Laden Dead May 1,2011/Hitler Dead April 30,1945 66 Years Apart!Another 6 is coming this year.Microchip-666 in hands and fhaeoerds.Hell is real!Middle East and Israel conflict,WWIII?-Bible Prophecy!TO NON BELIEVERS REPENT SAVE YOUR SOULS.JESUS IS COMING!Get raptured not suffer the great tribulation.LISTEN TO PAUL BEGLEY IN YOUTUBE.